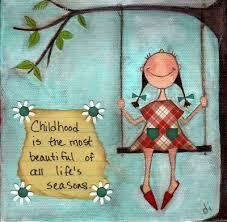 The older I grow, the more firmly I believe that the few joys of childhood are the best that life has to give. I firmly believe in that statement because in childhood, youngers have a great deal of leisure time. For ιinstance, they can listen to music, spend some time on computer games and generally satisfy most of their wills if they are not banned. However, there are some restrictions that offspring have to follow, such as not wear make up at school, stay up late at night, so there is not enough freedom and that makes them fly into a rage. Being an adult has many advantages, like going on trips, hanging out till late night and generally spending their time based on their tastes. Although olders can do things easier, being one of them has some drawbacks to. First of all, they have many obligations, also they have to work to satisfy their needs. So, taking everything into consideration, both steps of our ages have different pros and cons each one and we should try to joy every of them, but beacause childhood never gonna happen again in your life try to pass this time like tomorrow doesn't exist.